McALLEN — U.S. Border Patrol agents and Customs and Border Protection officers continue to suit up without pay during the partial government shutdown, which comes as the number of family units apprehended at the U.S.-Mexico border rises. On Tuesday afternoon, CBP representatives said more than 3,000 Border Patrol agents and other personnel in the Rio Grande Valley sector continue to work without pay. A little more than 200 employees have also been furloughed until funding for the government is approved. The release adds that these employees can use CBP resources during this partial government shutdown. “Recognizing this can be an incredibly stressful time, the Border Patrol has several programs available to all employees and their families to provide guidance and support. All employees, whether they are working or not-working during the partial government shutdown, are encouraged to utilize any available CBP resources as needed,” the release states. On Friday, the day after President Trump visited the Valley, Border Patrol officials continued to underscore a need for “additional border security resources in South Texas,” after apprehending more than 770 undocumented people, according to a Border Patrol news release. Border Patrol, when asked about a breakdown, said it had not determined how many of the 771 apprehensions were of family units. The number of apprehensions on Friday was the most in a single day so far this calendar year, Border Patrol officials said. As the shutdown continues, roughly more than 400,000 government employees are working unpaid while another 350,000 are furloughed at home, according to the National Treasury Employees Union. On Sunday, the NTEU filed a federal lawsuit to immediately stop the federal government from continuing to require employees to work without pay, according to a news release from the union. Also affected by the partial shutdown are CBP officers, who work at more than 300 ports of entry nationwide, including international airports and border crossings. CBP officials did not respond as of press time Monday to an inquiry about how many officers were currently being affected by the partial government shutdown. The high number of apprehensions comes on the heels of the president’s three-hour visit to the Valley on Thursday, which included a roundtable discussion on border security with local leaders at the Border Patrol station in McAllen, and a stop at Anzalduas County Park, where the president posed with agents in front of an armored vehicle and seized narcotics while declaring a crisis on the border. Of those 396,579 individuals, 107,212 were family unit apprehensions, and of the 396,579 individuals, 50,036 were unaccompanied children. Despite the president’s insistence that there’s a crisis on the border, the total number of apprehensions on the southwest border in fiscal year 2018 was less than half the apprehensions seen during the prior fiscal year, when Border Patrol agents apprehended 858,683 individuals, according to the website. Though far fewer people are being apprehended attempting to enter the country illegally, the number of family units apprehended at the border has increased from fiscal year 2017 when Border Patrol agents apprehended 75,802 family units, to fiscal year 2018, which saw apprehensions top more than 100,000, with the apprehension of 107,212 family units. In the RGV Border Patrol sector, which is one of the nine sectors that encompasses the southwest border, including Big Bend, Del Rio, El Centro, El Paso, Laredo, San Diego, Tucson and Yuma, there was a 27 percent increase in family unit apprehensions, from 49,896 apprehensions in fiscal year 2017, to 63,278 apprehensions in fiscal year 2018. The presidential visit to the Valley came two days after Trump addressed the nation from the Oval Office — imploring a Democratic-led House for a physical wall to be included in any deal to reopen the shuttered government agencies. Shortly after the visit, U.S. Rep. Filemon Vela said people fleeing Central America coming to our border has led to a humanitarian issue, which takes precedence over any talk of construction of a physical wall. 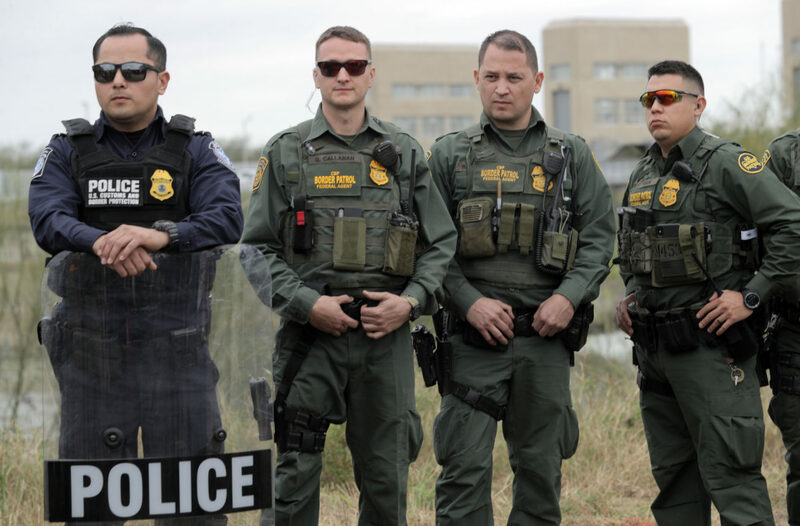 According to the agency’s website and most recent staffing figures, in fiscal year 2017 Border Patrol had 3,130 agents working in the RGV sector, and 16,605 total agents throughout the southwest border sector. This story has been updated to include the number of U.S. Customs and Border Protection personnel working without pay and who are being furloughed during the partial government shutdown.